Base Curb Weight - Refers to the weight of a vehicle and a full tank of fuel, but does not include passengers, cargo or optional equipment. Commercial Towing - This would be any vehicle and trailer combination exceeding 26,000 lbs. Gross Combined Weight (GCW). Commercial Vehicle - Any vehicle that exceeds 10,000 lbs. Gross Vehicle Weight (GVW). Gross Axle Weight (GAW) - The total weight supported by each axle (front or rear). To figure, take the loaded vehicle and trailer to a scale. 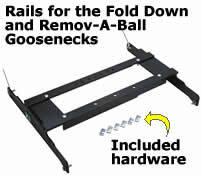 With the trailer attached, place the front wheels of the vehicle on the scale to obtain the front GAW. To obtain the rear GAW, weigh the towing vehicle with the trailer attached, but with just the four wheels of the vehicle on the scale. The rear GAW is determined by subtracting the front GAW from that amount. Gross Axle Weight Rating (GAWR) - This would be the total weight that each axle is capable of carrying. The total load on each axle must not exceed its GAWR. Gross Combined Weight (GCW) - This is the actual total weight of the vehicle and the trailer combined, determined by weighing both together on a scale. Gross Combined Weight Rating (GCWR) - A combination of the vehicle weight, the loaded trailer, plus cargo and passengers. Gross Vehicle Weight (GVW) - This is the actual weight of the vehicle when it is fully loaded. It is the combination of the Base Curb Weight and the cargo weight. Gross Vehicle Weight Rating (GVWR) - The maximun allowable weight of the fully loaded vehicle. Maximun Loaded Trailer Weight - This is the maximum allowable fully loaded weight of the trailer. It is obtained by subtracting the towing vehicle's GVW from its GCWR. Payload - The GVWR minus the Base Curb Weight or the combined maximum allowable weight of cargo, occupants and optional equipment the vehcile is designed to carry. 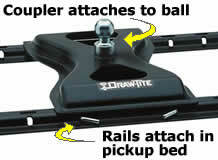 Tongue Weight (TW) - The downward force exerted on the ball by the trailer coupler. This is also sometimes referred to as Vertical Load. Data generated in 0.002363 (s) from 6 queries.